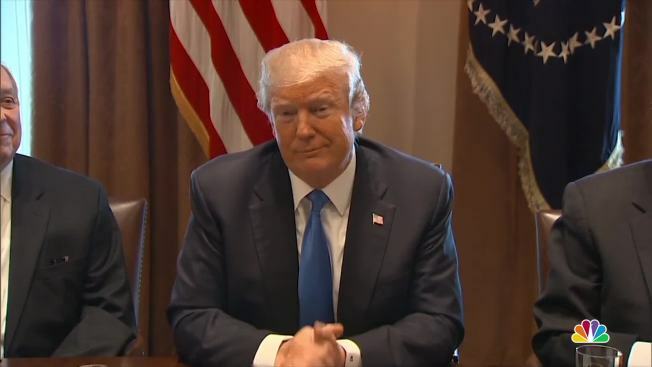 President Donald Trump thinks he would beat Oprah Winfrey in a presidential election, but that she won't run anyway. 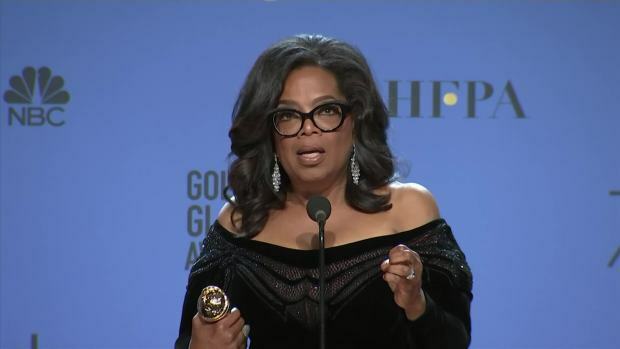 His comments came as Democrats nationwide encourage Oprah Winfrey to seek the presidency in 2020 after she gave an impassioned call for "a brighter morning even in our darkest nights" at the Golden Globes on Sunday night. Those closest to the media mogul are sending mixed messages about her political intentions. Her best friend, CBS News host Gayle King, said Tuesday that Winfrey is "intrigued" by the idea of a White House bid. "She loves this country and would like to be of service in some way, but I don't think she's actively considering it at this time," King said, noting that she spoke to Winfrey at length the night before. "I also know that after years of watching the Oprah show, you always have the right to change your mind." On Monday, Winfrey's longtime partner, Stedman Graham, told the Los Angeles Times that "it's up to the people" whether she will be president, adding, "She would absolutely do it." But Trump indicated on Tuesday that he'd be up for the challenge, saying a contest between the two former TV stars "would be a lot of fun" but that he'd win. "I like Oprah. I don't think she's going to run," Trump told reporters in the White House, adding that he knows her well and was on her show as it came to a close. The presidential buzz follows Winfrey's speech, which left some viewers contemplating the idea of the Democratic Party embracing a celebrity candidate of its own to challenge Trump in 2020. Trump, of course, was little more than a businessman-turned-reality-television-star before his extraordinary political rise. House Minority Leader Nancy Pelosi, D-Calif., noted that Winfrey, like Trump, lacks any kind of governing experience. Even so, for Democrats in early voting states, and perhaps for a public that largely disapproves of Trump's job performance, the notion of a popular media figure as a presidential candidate is not as strange as it once seemed. "Look, it's ridiculous — and I get that," said Brad Anderson, Barack Obama's 2012 Iowa campaign director, who supports the idea of Winfrey running. "At the same time, politics is ridiculous right now." Winfrey's speech as she accepted the Cecil B. DeMille lifetime achievement award touched on her humble upbringing and childhood wonder in civil rights heroes. But it was her exhortation of the legions of women who have called out sexual harassers — and her dream of a day "when nobody has to say 'me too' again" — that got some influential political operatives thinking Winfrey might be just what the Democrats need. Her appeal extended well beyond her celebrity, some said, citing her compassion, kindness and devotion to helping others as a badly needed change after Trump. "People need to have hope," said Ray Buckley, chairman of the New Hampshire Democratic Party, who encouraged the idea of an Oprah run. "If it means looking at one of these celebrities that have a moral core, that are compassion and intelligent, I think that people should look to where they can during these very, very difficult times." Even Trump's daughter Ivanka endorsed Oprah's message, if not a political future, in a tweet Monday. "Just saw @Oprah's empowering and inspiring speech at last night's #GoldenGlobes. Let's all come together, women & men, & say #TIMESUP! #UNITED." The 64-year-old media mogul has become a cultural phenomenon over the past 30-plus years, born into a poor home in Mississippi but breaking through as a television news and talk show personality in the 1980s. Over 30 years, she became the face of television talk shows, starred and produced feature films, and began her own network. Trump himself has lavished praise on Winfrey over the years, including in 2015, when he said that he would consider her as a running mate on his Republican ticket. "I'd love to have Oprah. I think we'd win easily, actually," Trump told ABC News at the time. Late-night show host Jimmy Kimmel said Monday that he preferred Winfrey to Trump. "Given the choice between Oprah and our current president, I'm on the bus with Oprah traveling the country encouraging people to sign up and vote," he said. Some political operatives think she has what it takes to be a viable presidential contender. NBC's Asher Klein and Associated Press writers Andrew Taylor and Dave Bauder contributed to this report.